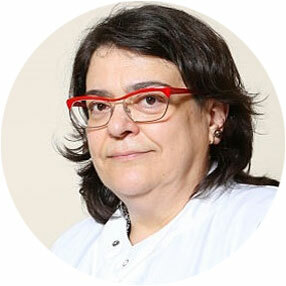 Dimitra is a Senior Team Leader at the Joint Department of Physics, Division of Radiotherapy and Imaging of the Institute of Cancer Research and the Royal Marsden NHS Foundation Trust, London, where she established the team of Multimodality Molecular Imaging. Earlier in her career she held senior research positions at Yale University, CERN, UCL and University of Surrey always sponsored by prestigious personal research career development fellowships. Her research interests focus on the conceptual design, development, system-level performance optimisation and realisation of emerging medical imaging techniques and innovative instrumentation for precision and quantitative molecular imaging and for the next generation of healthcare hardware in close collaboration with major healthcare manufacturers and radiation detectors and electronics industry. She is a member of several international professional societies (IOP, IPEM, ESMI, and IEEE), she has had several expert advisory and reviewer roles in industry, governmental bodies, EC and NHS and has also served on several high-level committees of the IOP Council and Professional Groups. She is currently Member, Panel for Biomedical Engineering, Royal Academy of Engineering; elected Member, Nuclear & Medical Imaging Sciences Council, IEEE, Chair, Board of Trustees of Mayneord-Philips Trust and immediate past Chair, IOP Medical Physics Group.